Calling fulgurite a gemstone is a bit of a reach, however you can actually buy fulgurite jewelry. Fulgurite is definitely not like the clear glass sculptures you may have seen in the movie “Sweet Home Alabama”. 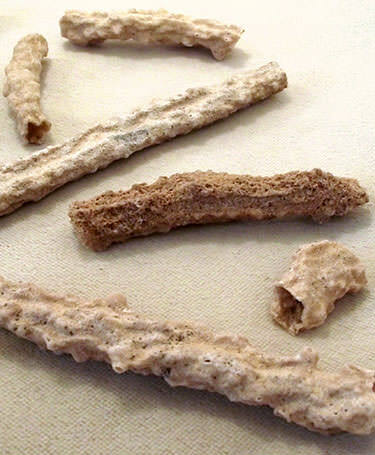 Most of them look quite plain in reality, but what is fulgurite and how is it formed? Where Can I Find Fulgurite Myself? How Can I Make Fulgurite? Sand fulgurites from Algeria – the color of fulgurite depends on the color of the sand. Fulgurite is named after the Latin word for lightning: ‘fulgur’. The reason is that fulgurite is formed when lightning strikes sand. Most sand melts around temperatures of 1800 °C. The air temperature of lightning can reach up to 30,000°C. So when a lightning bolt strikes the sand the silica melts almost instantly and fuses together when it cools. Usually it forms a kind of tube with smooth inner walls and rough grainy outer walls. The rough outside is because the sand further away from the center does not fully melt and keeps part of its former shape. The so-called ‘lightning glass’ that is formed during these lightning strikes is made up of whatever sand was in the vicinity. This means that fulgurites are not made up of a single mineral, but often a number of different minerals. That is why fulgurite is called a mineraloid, instead of a mineral. (Find out what the difference is between minerals and mineraloids). Fulgurite does not only form in sand, it can also form in silica-rich rocks. Most of these ‘rock fulgurites’ are very small and hard to find. 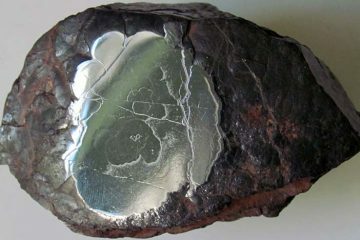 Lightning cannot travel far into the rock and in most cases will only leave scorch marks, instead of a hole or tube. 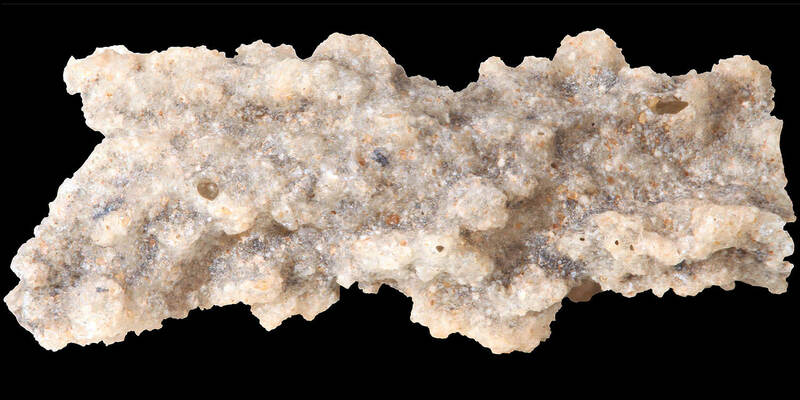 The official name of fulgurite is lechatelierite variety fulgurite. 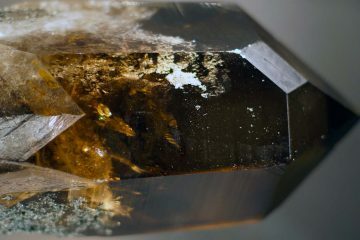 Lechatelierite is glass that is formed during moments of intense pressure and heat. An example is tektite. Tektite is formed when a meteorite strikes sand, the most famous example of this is a gemstone called moldavite. Generally fulgurite is only a few centimeters in size. It is possible to find far larger fulgurites under the right conditions though. There are reports of fulgurites that were several meters long. Unfortunately it is very hard to keep these in one piece as fulgurite of this size is usually quite fragile. The hardness of fulgurite depends on the type of sand or rock it was formed from. In general fulgurites are not very tough and they can easily be damaged. The color of fulgurite depends on the type of sand that was struck. Typical colors are white, yellow, gray and reddish. Black fulgurite exists but it is rare. If you see a fulgurite in a color not found in sand you are likely dealing with dyed or man-made fulgurite. Fulgurite can be found anywhere in the world. All that is needed is lightning and sand or silica-rich rocks. The most common sources are beaches and deserts. Fulgurite is only used for decoration. Most of the time it is displayed in a mineral collection, but fulgurite jewelry does exist. It is not that hard to find fulgurites if you know what to look for. Hardly anyone is searching for them so even places with a lot of visitors can be a good spot to search. The best places to search for fulgurites are beaches and deserts. Spots that are higher than the surroundings are the best place to start a search. Examples are dunes near the beach and small hills in a desert. Mountaintops are frequently struck by lightning, but despite frequent strikes it is hard to find fulgurites there. The reason is that most rocks at these mountaintops are not rich in silica and you will find scorch marks at best. The best time to start your search is after a severe lightning storm has hit the area. Do not go out during or just after a lightning storm. You do not have to worry that anyone is going to beat you to finding fulgurites, hardly anyone knows they exist and even fewer actively look for them. Once you think you have spotted a fulgurite you should not immediately grab it and try to pull it free. Sure, it is easy, but if you happen to find a large fulgurite you just destroyed most of it. You should carefully brush the sand away and see if there are any branches and get an idea of how large it is. Small fulgurites are easy to excavate by yourself and should take a few minutes at most. If you happen to find a large and/or branching piece you might want to bring a hand shovel and a brush. This way you can safely speed things up. All that is required to make a fulgurite is running a strong current through a source rich in silica (sand is the best choice). The easiest solution is to give mother nature a hand. Keep an eye on the weather forecast. If a large storm is expected to hit your area you should start your preparations. You should go to an exposed spot with lots of sand (or bring your own) that is higher than the surroundings. At this spot you should drive one or more metal spikes or rods about a feet into the ground. The more the rod sticks out of the ground, the better. There is no guarantee that lightning will strike your rod so you can pick a few spots to improve your chances. Important: Obviously do not do this anywhere near people, animals or property. Make sure you are allowed to place the metal bars and there are no laws against removing the fulgurite afterwards. State and national parks often have laws against taking objects home. If you are lucky and lightning struck your metal rod, do not touch the metal or sand just yet! You can severely burn your hands if you are not careful, make sure everything has cooled off. Another way to create fulgurites is to run a strong current through (slightly wet) sand yourself. This is not an easy method, it is expensive and requires special equipment. Do not try this at home! You can check a cool video of artificial fulgurite production below. Fulgurite is not especially beautiful compared to most other gemstones. However, its story is very interesting and makes for a good conversation starter. Most fulgurite is bought for mineral collections and not jewelry. Still, if you or the person you are buying jewelry for are interested in nature or science it can be a great gift. A piece of advice: only buy a fulgurite pendant. Fulgurite rings or earrings are almost impossible to find, and for good reason. Fulgurite only starts to look interesting in larger sizes and it is quite fragile. A pendant keeps it out of harms way and a larger fulgurite does not look out of place. Fulgurite is quite cheap. Most dealers sell it for a few dollars per gram (not carat). Very large and white pieces can sell for significantly more as these are quite rare. Fulgurite with lots of branches are also highly sought-after. Still, you can buy a beautiful example of fulgurite for less than $100. If you are not picky you can buy them for less than $10 at a local rock shop. Usually only high quality fulgurites are used in jewelry. This is why most sterling silver fulgurite pendants sell in the range of $50-100. Gold fulgurite pendants are rare as the gold will easily triple the price of the pendant. Very few stores carry fulgurite jewelry and none specialize in it. Your best option is to take a look at Amazon as they usually have at least some pieces for sale. Just make sure to look at the feedback first before you make a purchase. Fulgurite is hardly ever imitated as it is quite hard to imitate and not popular and expensive enough. Artificial fulgurite on the other hand is not that hard to make. All you need is sand and a current high enough to fuse the sand together. It is very hard to see the difference between natural and artificial fulgurite. The most obvious giveaway is seeing an abundance of low priced high quality fulgurite. 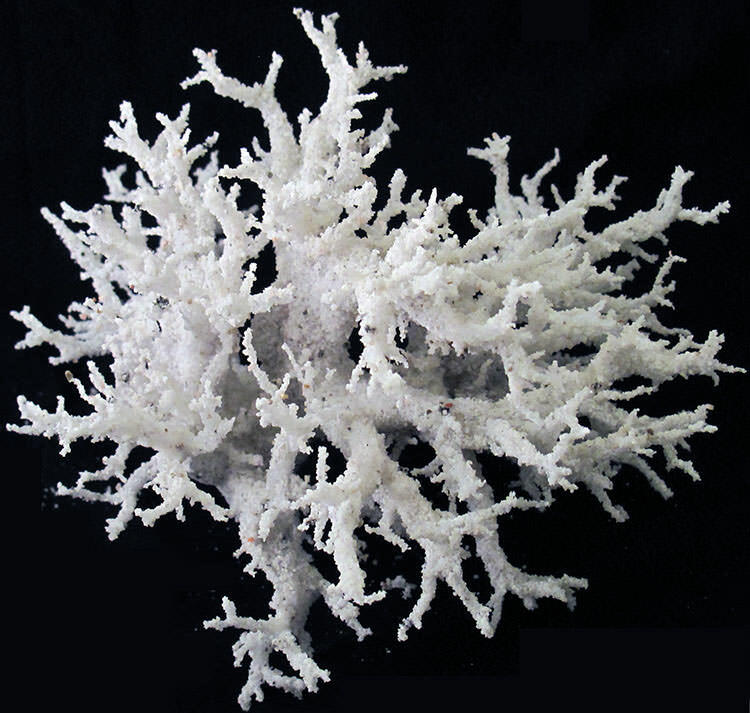 High quality artificial fulgurite is very white and has lots of branches (seen below). Your best option is to only buy from a reputable local source or to check reviews and feedback when buying online. Fulgurite is not known to be enhanced. Though it is possible that some dealers will ‘repair’ fulgurites that were damaged. Basically they will glue pieces together that were once part of a larger fulgurite. In extreme cases they will simply glue anything together that looks good. Some eBay sellers are notorious for this. Cleaning fulguriteshould be done very carefully. Fulgurite can be very fragile and you should only use soap and warm water if absolutely necessary. Never use an ultrasonic cleaner. Steam cleaners should also be avoided. If your fulgurite has small branches you should be extremely careful. These branches are very fragile and can snap at the slightest touch. Storing fulgurite is not hard, but you should still be careful. 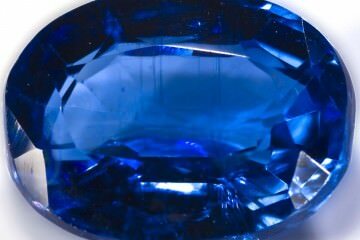 Keep it away from other gemstones and hard objects. The best option is to store your fulgurite jewelry in a pouch or even better, in a jewelry box. If you display it in a mineral collection you should make sure the branches do not stick out. A glass display is an excellent choice to keep it safe at all times. It is possible to repair fulgurite if you do have an accident by gluing . You should keep in mind that this will significantly lower its value. Please mention that your fulgurite was repaired if you decide to sell it later on. A typical example of a fulgurite, note the hollow core. Due to the size of the fulgurite it is likely that this is only a small part of the fulgurite that was created. The only ‘gemstones’ that are similar to fulgurite are other varieties of lechatelierite. The most well known is tektite glass, created during meteor impacts. Moldavite is the most famous example. 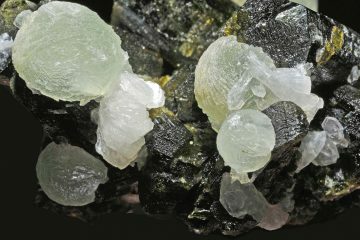 Moldavite is green, but white tektites can be found. Mindat – A great gallery of fulgurites in various colors, sizes and shapes. 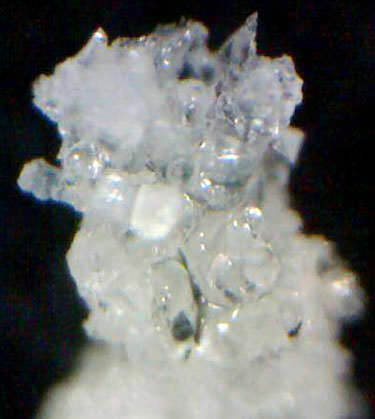 Glass Art Society – Info on what is probably the largest-scale fulgurite creation experiment ever. Great article, from experience I can tell you that it can take quite a while to get an idea of where to find fulgurites in the desert. A nice way to make things easier on yourself is to take along some metal rods the next time you go hunting. Stick the metal rods in the ground (somewhere easy to find again, so not too remote) and head home. Once a storm has passed and you are in the area pay a visit to the metal rods you left behind. Chances are lightning has struck the rods themselves or the vicinity. If lightning struck the rods the fulgurite will be easy to find, right beneath the metal rod. Otherwise you’ve got some hunting to do, but it narrows your search down a lot. Success is not guaranteed, but it sure increases your chances! Thanks for the advice, quite useful if you are planning to make multiple trips to the same area. Just keep in mind that leaving metal rods lying around will be frowned upon in some places. So make sure you’re not violating any rules or get permission beforehand. I really like this idea and with all this white sand at the beach and sea shore, I should have no trouble creating the perfect conditions. I suspect copper rods would be best. Sciencemall.com has a variety of fulgurite jewelry if anyone would be interested. Very cool article by the way! I have a very LARGE piece of fulgurite (approx. 16″x6″ & 10lb) from the California Sierra Nevada foothills,(gold country) that I would like to sell, but have no idea where,how, how to price it or anything ! Can you/somebody help me w/this ? It has a large center “glass” section w/many small “runners” coming off the main section. It is a beautiful blackish purple. I have a fulgurite collection . Fulgurite site is in Palm Springs. Specimens have more branches than any fulgurite you will see on any site. Send me an Email and ill send you pics. I have rock fulgurite that was confirmed by a geologist at UND Nels F. I have pictures as well I could send but I have a large amount of it. Mostly black mineral type looking glassy, I am not overly familiar with it but am learning as I go. Please let me know if you can where is the best place to start selling it. Your best option would be to contact a local rockhounding club and see if they are interested. Even if they don’t want to buy any they might know someone who is interested. I am interested in buying a large piece as a gift for my husband, but I can only find small pieces for sale online. I’d only like something large in size to put on display, preferably non-man-made. If someone has something they’re interested in selling and shipping, please let me know and I’ll send you my email.